MANAMA – The leader of Bahrain’s largest opposition group has urged Saudi Arabia to withdraw its forces and called for a UN inquiry into a crackdown on mainly Shia protesters that has raised tensions in the oil-exporting region. 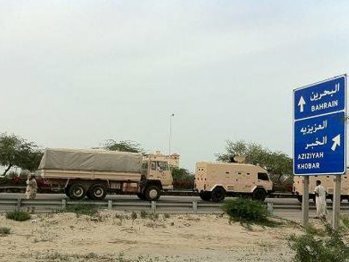 Bahrain arrested seven opposition leaders on Thursday, a day after its forces moved in to end weeks of pro-democracy protests that have sucked in troops from its fellow Sunni-ruled neighbour and prompted the king to declare martial law. Among those detained were Haq leader Hassan Mushaima and Wafa leader Abdel Wahhab Hussein, who had led calls for the overthrow of the royal family, Wefaq officials said. More moderate Wefaq had limited its demands to wide-ranging political and constitutional reform. Also arrested was Ibrahim Sharif, head of the secular leftist party Waad that signed up to the same demands as Wefaq. “Two of the thugs climbed over the fence to get in our yard, one went over and pointed a gun in Ibrahim’s face and the other went to our garage to let everyone else in,” Farida Ismail, Sharif’s wife, told Reuters by telephone. Three protesters died in the crackdown but so did three policemen mown down by demonstrators in fast-moving cars. The crackdown has drawn sympathy protests from Shias across the Gulf Arab region, including Saudi Arabia and Iran has complained to the United Nations. Iran, which supports Shia groups in Iraq and Lebanon, asked countries in the region to join it in urging Saudi Arabia to withdraw troops from the Gulf Arab island state. “How could one accept a government to invite foreign military forces to suppress its own citizens?” Iran’s Foreign Minister Ali Akbar Salehi said in a letter to UN Secretary General Ban Ki-moon, also addressed to the Arab League.